Fitness apps aren’t the only ones that can present this kind of problem. Last week, business networking site LinkedIn removed a feature that let users export their contacts. This prompted a huge backlash from disgruntled users. At the heart of the controversy was the question of who owns the data on social networks — the platforms that provide the service or the users who create the content and connections. LinkedIn quickly caved in to pressure, saying “we’ve heard you loud and clear” and reinstating the export feature. Why are we letting running apps run off with our data? Sadly, it seems us runners are less militant than the guys in suits who successfully lobbied LinkedIn. We put our blood, sweat and tears into the runs we log and yet most of the apps we use make it difficult for us to export our hard-earned workout data. Switching services: If you can’t easily export all your runs, when you switch to a new app you’ll have to start from scratch with no workout history. Backing up your workouts: If you don’t have a copy of all your workouts, you’re at the mercy of the service you are using. What if they shut down or lose your data? Which data formats are best? When you export a workout, it is squeezed into a small XML file. Each individual workout is a separate file, so if you download 100 runs, you’ll end up with 100 files. You can store these as a backup for safekeeping or upload them to a new running site if you want to switch services. The best format for exporting running data is GPX. This rich, standard XML format includes all the mapping data from the run. It can also include other data such as heart rate and elevation. It is supported by most running apps and you can even open these files using Google Earth. TCX is also sometimes used. It contains similar information to GPX, but it was designed originally for Garmin devices and is less widely supported. Some Garmin devices now use FIT files instead. Finally, there is the CSV format, which is pretty basic. It lets you view your data in Excel but not much else. It does not contain all the GPS mapping data, and you can’t usually upload it into a new service. I tried out various running sites this week to find out what options they provided. Here’s what I found. 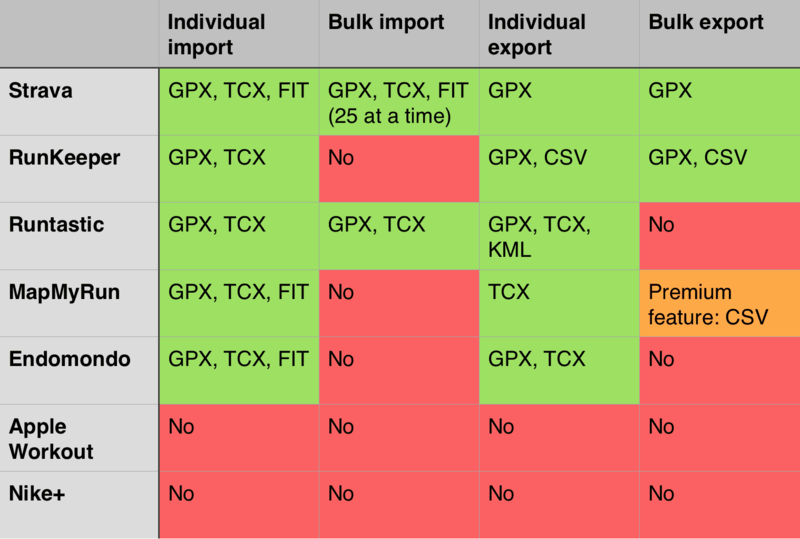 Comparison of import and export options on popular running apps (as of July 31, 2015). Surprisingly, Apple and Nike are the least helpful when it comes to exporting your workout data. What goes in can’t come out — they’re happy to store your workout data for you, but they don’t provide you with any tools to export it. Over the past seven years, I have logged more than 20,000 kilometers with Nike+. That’s halfway around the world. It would not be practical to export and import each of those 2,163 runs individually. And I’m not alone. Anyone who runs regularly will quickly build up a log of hundreds or even thousands of runs. So to switch services, you need to be able to download and upload them all at once. Since every GPX file contains a single run, bulk import and export tools must be able to handle multiple files at once. Strava deserves a special achievement award in this respect. They were the only service I tried that offered both bulk export and bulk import free of charge. Runtastic also deserves credit for allowing you to import multiple GPX files very easily, but from what I could see they only allow you to export GPX files individually. I could not find any officially supported way to bulk import/export with MapMyRun or Endomondo. Sometimes you can use third-party apps to reclaim and move your data. Unfortunately, if you have logged all your runs using Apple’s Workout app and now want to switch to another service, you are out of luck. There’s no way I could find to export this data. For Nike+ users, however, there are third-party solutions. These services are not officially supported by Nike and they involve trusting the third-party developer with your Nike login details, so use them at your own risk. I used Nike+ Data Downloader by Matthew Stuehler. This app enables you to export your Nike+ run data (including GPS and heart-rate data) to Strava, RunKeeper or MapMyRun. Nike+ helped me get fit and turn my life around after I recovered from cancer. To say that I’m emotionally attached to it is an understatement. But, like those angry LinkedIn users, I want to be in control of my own data. Thanks to Nike+ Data Downloader, I’ve been able to export most of my runs into Strava, and I have to be honest: I really like what I see on Strava. For a while, I think I will be using both services. I would be more confident in sticking with Nike+ if the service provided an officially supported option to export my runs. Without it, I feel like I might be running up a blind alley.